This is a great top, because it's just a bit more than just a plain tank top! It has a built in shelf bra, and a babydoll-type tie in the back, that tightens up the empire waist just enough to that extra support you might need! They hit approximately mid-upper-thigh, but are available extra long as a special order. ** NOTE: All of our swimsuits are uniquely designed to wear with your own bra for maximum support (even though most come with a shelf bra, they can only do so much! ), cleavage, and to slim the midriff. 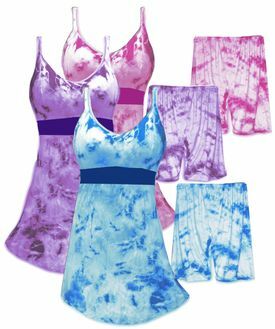 Unlike other swim dresses, ours can also be worn with pants or a skirt so it looks simply like a top over them. This means you can dress for dinner with the swimsuit, coordinating pants and a jacket, and afterwards, drop your pants and jacket by the pool and dive in for a swim! IMPORTANT! These are made to order, so they take approximately 4-7 days before they will ship out from here! You can special order RUSH THEM as follows; on the 2-3 day rush, that means it will leave here within 2-3 working days (If you order it on Wednesday, it will leave here on or before the following Monday, etc. ), and then with the super rush, it will leave here within 1 business days (if you order it on Monday, it will leave here on or before Tuesday, if you order on Friday, it will leave here Monday, etc.). 1x - Chest:45" - Hip:53"
2x - Chest:50" - Hip:58"
3x - Chest:54" - Hip:62"
4x - Chest:58" - Hip:66"
5x - Chest:62" - Hip:70"
6x - Chest:66" - Hip:74"
7x - Chest:70" - Hip:78"
8x - Chest:74" - Hip:82"